Fair Trade Towns; connecting communities across the world. I recently represented Fair Trade Wales at the 2017 International Fair Trade Towns Conference in Saarbrucken, Germany. The conference is an annual event that brings together Fair Trade supporters from across the globe to discuss Fair Trade, and the Fair Trade towns scheme in particular. 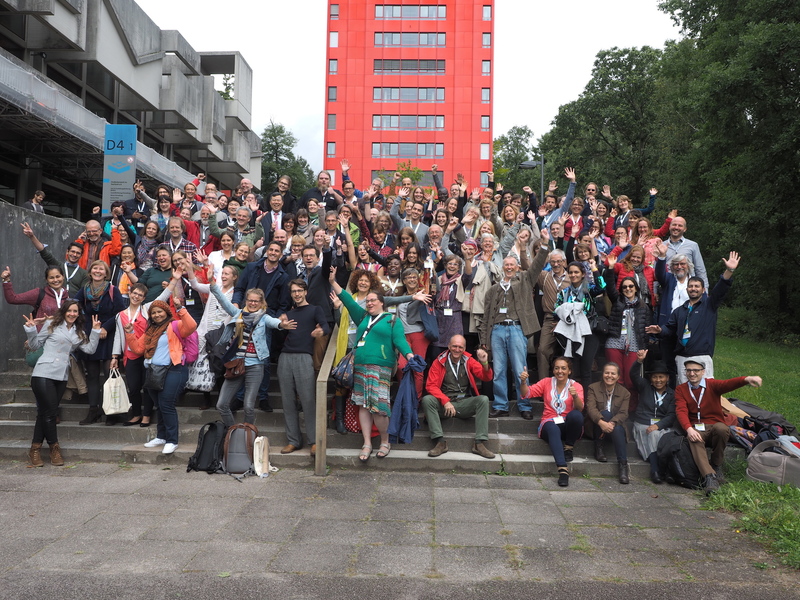 This year saw 200 delegates from 24 countries, including Japan, Canada, Spain and Korea gather to discuss latest updates in the world of Fair Trade; tackle challenges, share learning and inspire one another! There are 38 Fair Trade towns in Wales, a total of 631 in the UK, and 2,000 globally. That total was updated during the conference, and how timely. An amazing achievement highlighting the breadth and strength of this brilliant civil society-led campaign, and further fuel to drive the movement forward to more towns and countries across the world. This year’s conference was the 11th in the series, and for the first time was held between three neighbouring countries; France, Germany and Luxembourg. I travelled with Elen Jones (Fair Trade Wales’s National Coordinator currently seconded to the Future Generation Commissioner’s office) who chaired a brilliant public debate with a panel of MEPs and UN representatives on the topic of the European Union’s role in promoting Fair Trade. Changing trade deals and Brexit are but two factors affecting small scale producers across the globe. I attended a workshop that focused in more detail on one commodity that will soon see dramatic changes in the way it is traded: sugar. EU policies have just changed, and this will result in difficulties for small scale producers fighting against giants who control much of the world’s sugar; its availability and its price! Many of the common themes like supporting local as well as Fair Trade and celebrating and learning from the achievements of small nations like Wales, Belgium, Ecuador and Lebanon to me were great! As a farmer’s daughter from a tiny nation like Wales, sustainable production and fluctuating market prices are topics that I’ve learnt about from a young age. It was therefore interesting for me to hear repeated mention of various campaigners highlighting the need for Fair Trade in developed, as well as developing countries. I believe Fair Trade is much more than just a fair price and added premium – it’s about equipping farmers and producers with the knowledge, skills and resources required to produce good quality produce, sustainably. Updates were given from global representatives about changes in the focus of various Fair Trade organisations. Fairtrade International spoke of how they’re investing in living wage. The WFTO mentioned changes in labelling systems and the International Towns Campaign highlighted the need to engage younger audiences within the movement. The Fair Trade Towns Conference also provides a platform for national coordinators and their representatives/ equivalents to share updates from a national level, with myself representing Wales this year. Wales has shown its pioneering commitment to equality and fairness, as the world’s first Fair Trade Nation and recently the first country in the world to put the UN’s Sustainable Development Goals into legislation in the form of the Well-being of Future Generations Act (2015). As I have mentioned many times previously, we are a small nation, but we are making mighty steps, and inspiring many along the way! For me, one of the highlights of the conference was meeting my peers from across the world, who share the same passion and vision: to see a world trading fairly. It was particularly great as a proud advocate of gender equality to meet amazing women, from Guinea to Japan; Ecuador to Germany who are blazing a trail in creating equal opportunities, and equal trade for all. One of my favourite sayings says; ‘It does not matter where the people are, have the people’s interest at heart, and everything else will fall in line’. There’s no denying that the Fair Trade Towns movement, and the Fair Trade movement more broadly is one of the people; one of collaboration, empowerment, innovation and change.